Hello again hello again everyone. I know I have been promising some extra comic reviews but things have been insane lately, as I’m sure you’ve been reading here. One of the big problems with invisible illnesses, especially things as harsh as cancer, is you tend to stop wanting to do the things you enjoy. I have been trying to get to things but other things just keep getting in the way. However, now that my kiddo is down for a nap and I have had some time to process things I will be trying to push ahead and get some more of these reviews done for you guys. So if things become late, just bear with me and know I feel bad about it… but I will be getting to them. 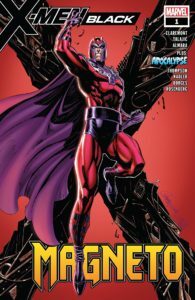 This comic is X-Men Black Magneto and we were able to pick this one up at Bearded Browncoat in Ocala. What we have is the first issue in the X-Men Black series which is focusing on the villains in the X-Men Universe. This was a pretty good issue where Magneto takes some time to stop at a dinner that’s pretty much in a town in the middle of nowhere. He makes friends with a human girl who asks about his tattoos from when he as a prisoner of the Germans as a kid in World War 2. During his time there, he sees a news program that is talking of mutants and some of the locals start to get riled up against mutants which almost sets off Magneto until the child he befriended stops him. We then see Magneto attacking the detention center/mutant camp that was seen on the news. He rips through sentinels even a new one that’s piloted by a person. Some of the mutants don’t want to go saying they could work better from the inside, but Magento is not one to keep Mutants in prison and thus he transports the whole prison away. After this, there was a second small short story about Apocalypse. This story shows Apocalypse getting ready to transfer himself into a new body. As the new host body fights back though Apocalypses scheme goes wrong and teleports him to some sort of new world it seems. This was quite an interesting and cool little story. Unfortunately, the Magneto part reminds me of the way the US has been going lately with all of the hate speech and such against Muslims and others who are different. If there is one thing I have always enjoyed about the X-Men comics, it is their message of inclusion for those that are different. What do you all think? Did you enjoy it? Share your thoughts with us here!